This man is born to rule. There are several indications in the birth chart. The Sun (1) is in conjunction with Lagna in Libra is the Special Position for Success for people with Lagna in Libra, a Human sign. In relation to Tanu-kaset, Mars (3) in Scorpio, the 10th (Career) House is Leo. The Ruler of Leo is the Sun (1), which is in conjunction with Lagna. The planet that represents career reaches self, and is also in Special position, indicating that he will attain a high position, be a leader. In relation to Tanu-kaset, Mars (3) in Scorpio, the 8th (Death) House is Gemini. The Ruler of Gemini is Mercury (4). Mercury (4) is in conjunction with Lagna, also the Special Position of Plenty for people with Lagna in Libra, a Human sign. The planet that represents death also reaches self, and is also in Special position, indicating that he will receive great inheritance. In relation to Tanu-kaset, Mars (3) in Scorpio, the 9th (Exaltation) House is Cancer. The Ruler of Cancer is the Moon (2), which is in Aires opposite Lagna and also very strong in Perseverance position. Having the planet that represents honor able to reach self in another indication. The four planets that are related to royalty, the Sun (1), Mars (3), Jupiter (5) and Ketu (9) are on either side or in conjunction with both versions of self, Lagna and Tanu-kaset, a high probability that he becomes a king. This book is written in 2009. 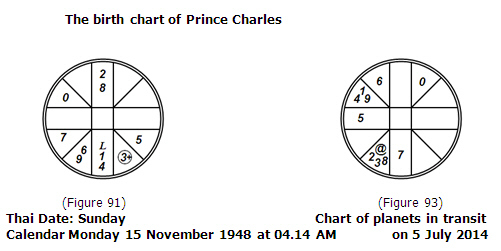 Based on the planet positions that can be calculated in advance, we believe that if the birth time is correct he will be King in 2014, at the age of 66. Between the ages of 64 and 68, the 1st (Self) House in transit, @, is in Virgo. The first indication is shown in the birth chart. In relation to @ in Virgo, the 9th (Exaltation) House is Taurus. The Ruler of Taurus is Venus (6). While @ is in Virgo, therefore Venus (6) represents honor. In the birth chart, Venus (6) is in Virgo. @ is in conjunction with Venus (6). Self in transit reaches the planet that represents honor. Venus (6) in conjunction with @ is also the Special Position of Plenty for people with Lagna, or @ in Virgo, a Human sign. This is makes Venus (6) the planet representing honor especially strong. In relation to @ in Virgo, the 4th (Home) House is Sagittarius. In the birth chart, Jupiter (5) is in Ruler position in Sagittarius. Jupiter (5) in the fourth House is the Special Position of Lotus and the Special Position of Plenty while @ is in Virgo, a Human sign. It indicates special height of achievement while @ is in Virgo. In the transit chart, we can narrow down the period to July 2014. In that month, Jupiter (5), the planet of double Special Positions while @ is in Virgo, transits into Cancer. In relation to Lagna in Libra, Cancer is the 10th (Career) House. In relation to @ in Virgo, Cancer is the 11th (Luck) House. Jupiter in Cancer is also especially strong in Exalted position. The planet of special success and luck in the House related to career and luck is a firm indication. In relation to @ in Virgo, the 8th (Death) House is Aires. Its Ruler is Mars (3). In the birth chart, Mars (3) in Scorpio is strong in Ruler position and is in sextile with @. Therefore, while @ is in Virgo, major things related to death can occur to him. In the transit chart, Mars (3), now the planet of death, is in Virgo, in conjunction with @. Mars (3) in Virgo is especially strong in Perseverance position. It indicates a significant inheritance. In relation to @ in Virgo, the 2nd (Income) House is Libra, and the 9th (Exaltation) House is Taurus. Venus (6) is the Ruler of both Houses. Therefore, while @ is in Virgo, Venus (6) represents both money and honor. In the transit chart, Venus (6) in Taurus is strong in Ruler position. Taurus is the 9th (Exaltation) House in relation to @. The planet in transit that represents money and honor is in the House of honor, another strong indication. Finally, in relation to @ in Virgo, the 1st (Self) House is Virgo, and the 10th (Career) House is Gemini. Mercury (4) is the Ruler of both Houses. Therefore, while @ is in Virgo, Mercury (4) represents both self and career. In the transit chart, Mercury (4) is in Gemini, strong in Ruler position. Gemini is the 10th (Career) House in relation to @. The planet in transit that represents self and career is now in the House of career. In this House there is also Ketu (9), the planet of royalty, in transit. In that month, royalty reaches career. We therefore see his ascension occurring between the 1 July and 17 July 2014.